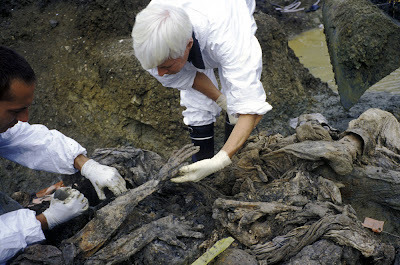 PHOTO: Forensic anthropologists Ewa Klonowski (right) and Piotr Drukier examine the partially preserved hands of a teenage boy, found in a mass grave of victims of the 1995 massacre of more than 8,000 Bosniak men and boys at the hands of Serb forces who overran the U.N. "safe haven" of Srebrenica. Click photo for higher resolution. /© Sara Terry. There is a multitude of evidence publicly available that proves that Bosnian Serb and other forces executed 7,000 to 8,000 Bosnian Muslim prisoners from Srebrenica in one week in July 1995. Despite this, there are still many people in Serbia and Montenegro who try to deny the full enormity of the crime that Bosnian Serb military, police and other forces (including, allegedly, forces from Serbia) committed. They argue that the actual number of dead is exaggerated, that ‘only’ around 2,000 died. They also argue that most of these 2,000 dead were casualties of war—Bosnian Muslim soldiers killed in battle. Some who are even bolder, claim that it was a 'crime of passion'—revenge for all those Serbs killed in the villages around Srebrenica. Still others claim that what happened at Srebrenica was not genocide. The Tribunal has proved beyond a reasonable doubt that each of these claims is wrong. In particular, in its proceedings against these three accused, the Tribunal has found beyond a reasonable doubt that Bosnian Serb and other forces killed between 7,000 and 8,000 Bosnian Muslim men and boys between approximately 11 and 19 July 1995. The Tribunal has established beyond a reasonable doubt that the vast majority of those killed were not killed in combat, but were victims of executions. The Tribunal has established beyond a reasonable doubt that the killings did not occur in a moment of passion, but were the product of a well-planned and coordinated operation. Finally, the Tribunal has established beyond a reasonable doubt that the killing of 7,000 to 8,000 Bosnian Muslim prisoners was genocide. The Tribunal has determined that the number of Bosnian men and boys killed in Srebrenica is between 7,000 and 8,000. In order to come to this conclusion, the Judges in the Krstić case accepted and reviewed a great deal of evidentiary material. Among the evidence that the Judges used to establish the number of people the Bosnian Serbs killed was that from the mass graves where the victims were buried. The Chamber reviewed evidence from 21 mass graves that had been exhumed by the ICTY from 1996 to 2000. (7) Of these, 14 were “primary gravesites”, where the victims’ bodies had been buried immediately after they were killed. Bosnian Serb forces subsequently disturbed eight of these primary gravesites in an attempt to cover up their crimes: during a period of several weeks in September and October 1995, they removed bodies from the primary graves and reburied them in other locations that are referred to as “secondary gravesites.” Seven of the 21 mass graves were such “secondary” burial sites. Determining the exact number of bodies in each of the mass graves was a very difficult task, which was complicated by the fact that Bosnian Serb forces mutilated and dismembered many of the remains when they used heavy machinery to exhume and rebury them. (8) Thus body parts from the same person could be found in two separate mass graves—a primary and a secondary one. Nevertheless, the forensic experts were able to determine the minimum number of bodies contained in all the discovered graves. That number was 2,028 victims. (9) At the time the judges in the Krstić trial issued their Judgement in August 2001, they noted that the Prosecution had identified 18 other mass graves that had not yet been exhumed. (10) In other words, the Judges recognized at that time that 2,028 exhumed bodies do not represent the sum total of the Bosnian Muslim men and boys killed at Srebrenica. The Trial Chamber in the Krstić case heard evidence of intercepted conversations between VRS soldiers, including the accused, which corroborates the fact that Bosnian Serb forces killed between 7,000 to 8,000 Bosnian Muslim prisoners. The intercept evidence corroborates the findings of the demographic expert and the exhumation evidence that shows that Bosnian Serb forces took prisoner and killed many thousands of Bosnian Muslim men and boys, and not just 2,000 as some people in Serbia and Montenegro claim. Perhaps the most compelling evidence that the Tribunal has heard that proves that Bosnian Serb forces killed 7,000 to 8,000 Bosnian Muslim men comes from the people who actually participated in the killing operation. In the Krstić trial, the Trial Chamber heard from Dražen Erdemović, a VRS soldier with the 10th Sabotage Detachment, who participated in one of the largest executions, which took place at the Branjevo Military Farm on 16 July 1995. Erdemović pleaded guilty to participating in these executions and later testified in the case against General Krstić. (18) Dražen Erdemović's description of how his unit killed their victims assists in getting an idea of how many people lost their lives during those five days in July. In his testimony, Erdemović explained that his unit received orders on the morning of 16 July 1995 to go to the Branjevo Military farm. Shortly after they reached the farm, buses carrying Bosnian Muslim men began to arrive. Erdemović and the other members of his unit were given orders to shoot the prisoners. Erdemović testified that, in his estimate, they killed between 1,000 and 1,200 Bosnian Muslim men on that day alone. (19) And the Branjevo Military Farm was not the only site at which executions took place: the Trial Chamber examined evidence of mass executions at a total of nine sites, including the Branjevo Military Farm. All of this evidence points in no uncertain terms to the accuracy of the estimate that between 7,000 and 8,000 people were executed in Srebrenica in July 1995. In Republika Srpska and Serbia one does not only hear that the number of dead was much lower than 7,000 to 8,000. One also hears that the victims were not civilians or prisoners of war, but rather soldiers who died in battle. Therefore, according to them, VRS forces were abiding by the laws of war and no crime was committed at Srebrenica. Lastly, killing an enemy soldier in combat is not a war crime. If those buried in the mass graves had indeed been soldiers killed in battle, there would have been no need for Bosnian Serb forces to execute a massive cover-up campaign. (26) And there is much evidence that proves that is exactly what they did in September and October of 1995. In order to cover up their initial crimes of killing civilians and prisoners of war, the Bosnian Serb forces committed another crime—they attempted to relocate the bodies. They used bulldozers and other heavy machinery to exhume a number of the mass gravesites and move the bodies to other locations. The Prosecution conducted forensic analysis of the 21 mass graves that it exhumed and found that some of the primary and secondary sites were linked. Forensic experts analyzed the soil, bullets and other materials found in the sites they exhumed and found that 12 of them were linked to each other. (27) The Trial Chamber in the Krstić case found that this evidence demonstrates an extensive campaign to conceal the bodies of the men who the Bosnian Serb forces killed and buried in mass gravesites in July 1995. This cover-up attempt shows not only that Bosnian Serb forces committed horrible crimes, but also that they were well aware that what they had done was against the law. Perhaps the most perfidious claim that one hears in Republika Srpska and Serbia is that Bosnian Serb forces killed the Bosnian Muslim prisoners from Srebrenica in revenge. It is claimed that Bosnian Serbs who perpetrated the massacre were upset by the crimes Bosnian Muslim forces committed against Serbs in the villages around Srebrenica,(28) and acted in the heat of passion, as if that would justify killing thousands of Bosnian Muslim prisoners. Revenge is not a defence under international law, which is clear to any army soldier and certainly experienced officers. It is a barbaric concept, and the law exists precisely to prevent it. Those who act out of revenge, or call on it in order to justify crimes, are dealing a blow to the rule of law, and thus to civilization itself. Nor can revenge morally justify killing 7,000 to 8,000 people simply because they share the same ethnicity as others who perpetrated crimes: one crime can never justify another. Proceedings before the Tribunal have proven beyond a reasonable doubt that Srebrenica was a planned killing operation, and not an act of revenge by emotionally agitated Bosnian Serb soldiers. It is impossible to kill 7,000 to 8,000 people in the space of one week without methodical planning and substantial resources. Soldiers have to be mobilized to guard the prisoners, to move them from holding locations to execution sites, and to shoot them. Multiple locations to hold the prisoners and to execute them need to be identified and secured. Thousands of rounds of ammunition to shoot the prisoners need to be supplied. Numerous vehicles and hundreds of litres of fuel need to be commandeered to move the prisoners. A number of bulldozers and excavators need to be commissioned to dig their graves. During a state of war mobilizing such resources cannot be done at the whim of a few crazy soldiers. It needs to be ordered and authorized by commanders at high-levels. In the Krstić case, the Trial Chamber heard a lot of evidence that demonstrated clearly that the Bosnian Serb army mobilized resources between 11 and 19 July 1995 in order to kill Bosnian Muslim prisoners. As is clear from the above, the Tribunal’s proceedings in relation to Srebrenica have established beyond a reasonable doubt that the massacre there was a carefully planned and coordinated operation. SREBRENICA VICTIMS THROWN INTO CAVE "SPILJA POLA"